His Building Blocks: So Excited--I replicated Rudy's Cream Corn Recipe! So Excited--I replicated Rudy's Cream Corn Recipe! 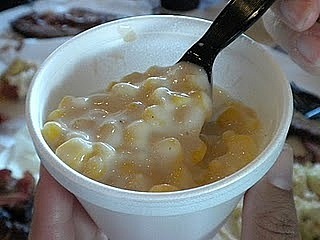 One thing our entire family loves is Rudy's, and especially their Cream Corn. Luke loves Rudy's so much (probably for the cream corn) that when we are far enough away to where I can barely see Rudy's, he is already exclaiming, "Mmmmmmm!" And it has gotten so bad that we often have to find a different route to get where we need to go at times, in order to avoid passing by Rudy's--that is, when we do not plan on stopping there. Otherwise, he is not happy at all and I end up going through my entire list of ways to distract Luke until he finally is OK with not stopping at Rudy's. So, I started thinking the other day that it was definitely time to figure out Rudy's cream corn recipe. I began by searching the web for copy cat recipes. I actually didn't find any that sounded perfect. Next, I took the best ingredients out of a few different recipes, used the measurements of one recipe that had the best reviews and....Voila! I FIGURED OUT THEIR RECIPE!!! Luke was in heaven!!!! Just to give Luke an extra special treat one night, I decided to give him two of his very favorite dishes: Pizza and Cream Corn. I had decided to make a Pizza (or, as Luke says, "Pipa") for dinner, and we had some cream corn left. I know, it sounds awful together, but Luke thought it was the best thing since.....well.....since cream corn by itself. Sliced bread is yummy but not that fascinating to Luke since everything seems to come to him pre-sliced/cut thanks to mommy. Luke giggled with pure happiness and satisfaction throughout this meal! Luke's happiness went through the roof when he noticed I put some homemade chocolate chip cookie dough in the oven to make cookies on this same night!! He watched them as they baked in the oven, and then of course, wanted one immediately after they came out of the oven. We distracted him while they cooled, removed his shirt so he didn't get the gooey chocolate all over it, and then let him enjoy one (ok, maybe one and a half). Back to the cream corn... Do you want the recipe? I guess I am willing to share. ;-/ But, I will warn you, this is very addictive and there will probably be lots of cream corn in your diet once you try the recipe at home! You are a GENIUS! Making brisket tomorrow, wish I wouldve seen this earlier when I was HEB. Frank, I really am not. I was just very passionate about figuring it out. I must give credit where credit is due. Those whose recipes I used from the internet did the work. I just used the ingredients that sounded the best together from those. One recipe I found figured out the portions....but her recipe was too light for me. I used a bit heavier ingredients.